The rich, creamy frozen treat glistens in the early morning sunshine. The toppings lined up like soldiers in formation ready to be dashed haphazardly atop a mountain of ice cream. 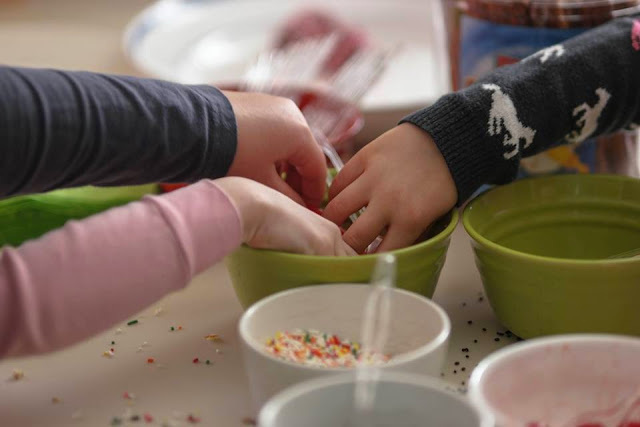 Sprinkles are strewn about with reckless abandon like the glitter of a school art project. 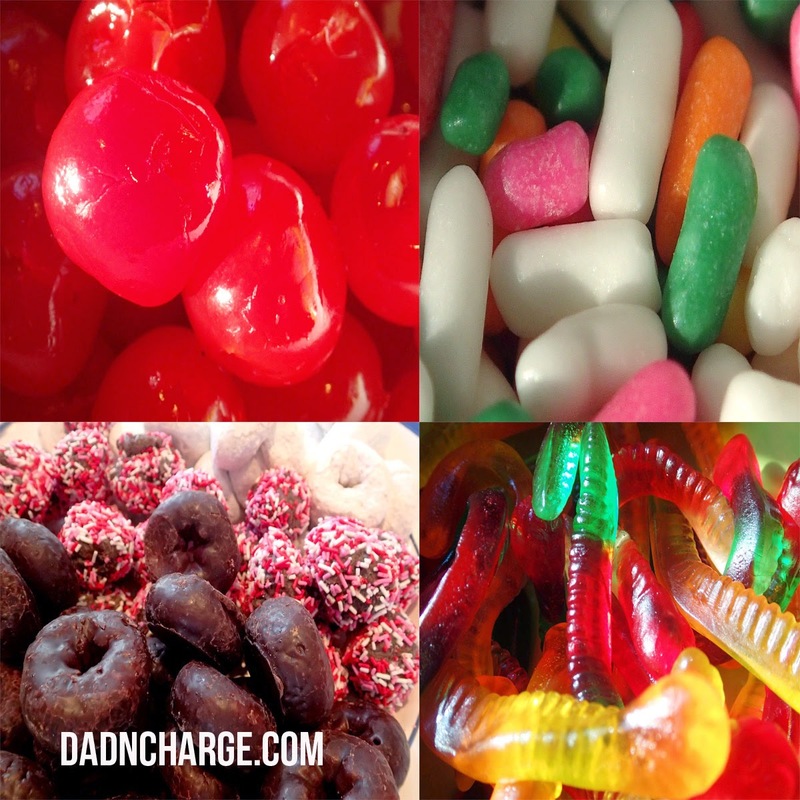 The gummy worms and gummy bears wait to lovingly adorn this mish mash of confectionary delight while cherries wait to be placed at the very pinnacle of the mountains of chocolate and vanilla. Little hands dart back and forth across the counter as each individual masterpiece is formed limited only by the individual's imagination. They think it is a trick. They think that their parents must have finally caved or they clearly must be insane. They think that all the cajoling and whining that they have been doing in their lives has finally broke them. They think that all common sense from their parental units has gone out the window and they are finally reaping the rewards. 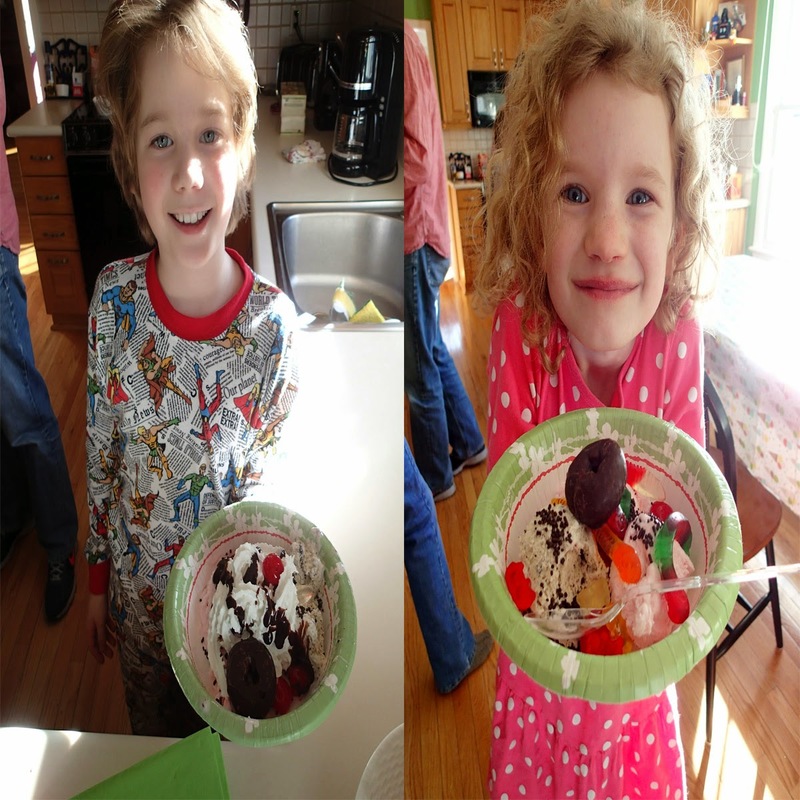 But here is the payoff, when you utter to them that they should wake up because it is Ice Cream For Breakfast Day, they are going to lose their minds and you are going to score some points for the coolest parents in the world. 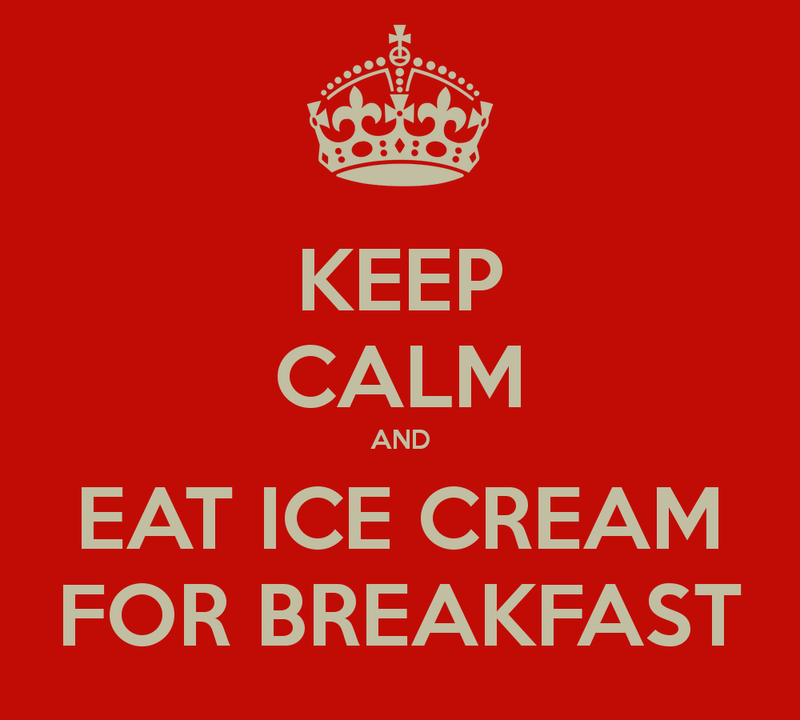 Ice Cream for Breakfast Day was invented by Florence Rappaport of Rochester, NY, the grandmother of my wife's childhood friend. Growing up in Upstate New York meant you had snow and lots of it. Winters meant the ground was covered and frozen and between New Year's Eve and Passover there wasn't that much to look forward to. So Florence and her husband decided one day that she would serve ice cream for breakfast to their children Ruth and Joe. On that first Saturday of February, a new tradition in their family was born. Being with family and making traditions is what ICFB is all about. Giving your children something to pass on in their lives and to others and giving them something to look forward to is what it is all about with kids. Your family might have a tradition to spend every 4th of July at a certain location or always spend a birthday at Disney World. Whatever your tradition is, making those lasting memories with your children is priceless. Let's face it. Ice Cream for Breakfast? That's pretty cool, pun intended. Joe and Ruth grew up and went to college and passed this tradition on to everyone they met. Soon, Ice Cream for Breakfast became a tradition for so many other families including my own. For our family we schedule a date on a weekend and invite every family we know. We stock up on ice cream, get all the fixings you could want, and provide the adults with coffee. 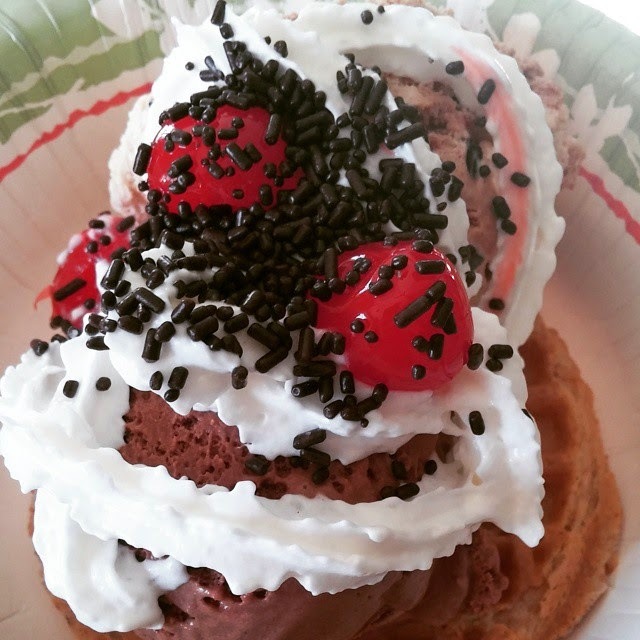 The kids can put waffles in the bottom of their bowls, make waffle ice cream sandwiches or just straight traditional sundaes. Then, totally hopped up on sugar, they go play while the adults socialize. It's a great time for all. At our party attire is pajama casual for the kids and any adults who want to don their bathrobe or PJs in front of others, it is early morning after all. I'm sold! Sounds like an awesome plan for Saturday, not to find time to get to the shps for all the "fixings"
Wait, wait wait, - you have to wake up your kids? Jealous. Anyway, I love this. It sounds like alot of fun. Tasty.